When the clock hits that final minute and it's crunch time, everyone knows someone has to step up and take the shot. You can manage missing the clutch shot, but someone has to take it. To step up in the final seconds of a game and take that dagger shot is something that takes a lot of guts. It takes even more guts to do it on the grandest stage in basketball, the NBA Finals. There have been numerous clutch shots that have won the game and either set the tone for the rest of the series, or completely put the momentum in one team's favor. 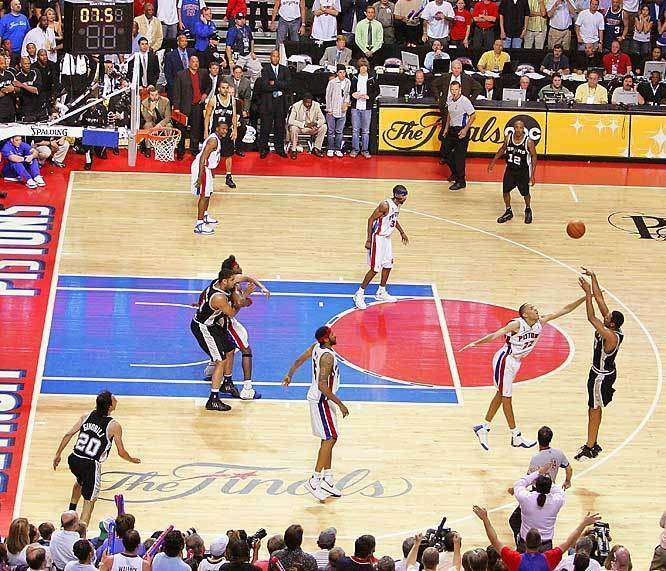 Today, I wanted to take a moment to look back at the most clutch shots in NBA Finals history and look at what made them so great in their own right. Let's get into it. -It was all good just a week ago. With Kyrie likely on the way out of the Cleveland, this shot has more significance than ever. After a grueling 7 game series where the Warriors and Cavs gave each other everything they had, it came down to the final seconds. With Kyrie holding the ball in his hands being defended by Steph Curry, he took a step back three pointer that silenced the crowd at Oracle making it 92-89. The Cavaliers would go on to win the game and the series of course, becoming the 2016 NBA Champions. For Kyrie, his legacy became instantly solidified after that shot. 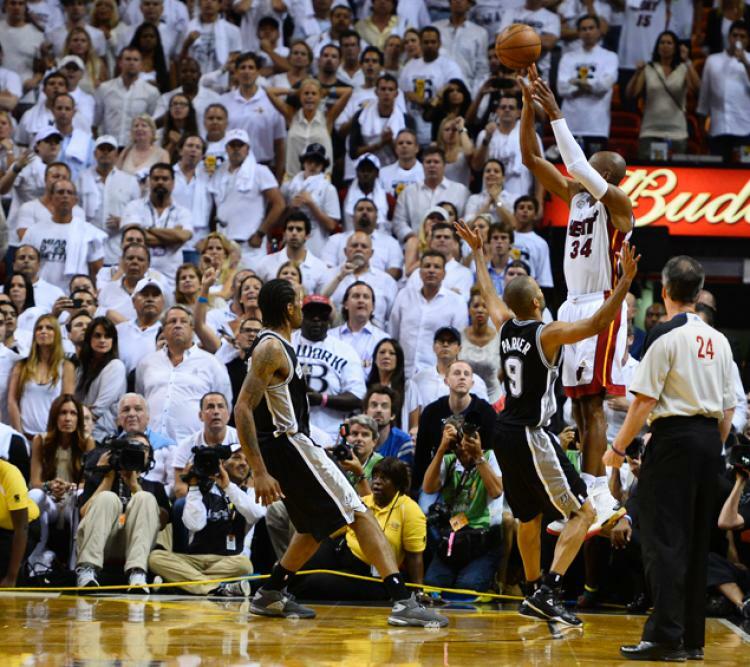 It was known as "The Shot", and this is easily top 3 in terms of the most clutch shots in the Finals. 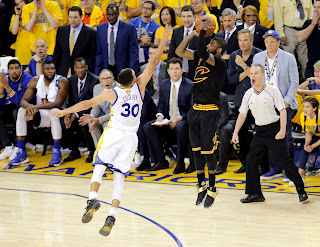 Years from now, when Kyrie takes his place in the Hall of Fame, this shot will be the biggest centerpiece of his legacy. Without that shot and Kyrie stepping up that series, the Cavs would NOT be NBA Champions. -While many don't necessarily recognize Steve Kerr as the big time shooter for when the game is on the line, over his career he had stepped up, but this shot was special. As Jordan was about to be swarmed by the Utah Jazz defense, Kerr found an open spot and took a 15 foot jumper that splashed through the net in the final seconds. 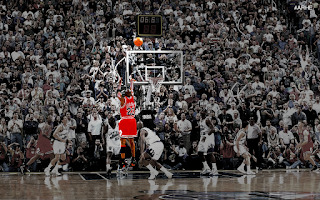 Not only was this a huge shot, it was the game winner and the series closer as the Bulls won game 6 and the NBA Title, their 5th in 7 seasons. This is the biggest shot in Kerr's career. -Mr. Big Shot Robert Horry is one of the most deadly guys in NBA history. At any given time he could strike with a shot that could change the outlook of a series. In this case, he changed the momentum of the series and brought the Spurs exactly what they needed. Surprisingly, Horry did this with an injured shoulder. What did he do exactly? 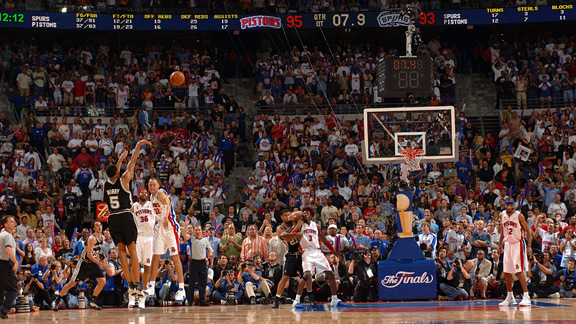 Well, with the Spurs needing a big shot to win the game, Horry stepped up and drained a massive three pointer with about 6 seconds left on the clock to close out the Pistons in Game 5. The Spurs would go on to win a tough defensive series in 7 games, but without Horry stepping up in Game 5, Detroit would have went back to back. -There are always unsung heroes in the NBA Finals. 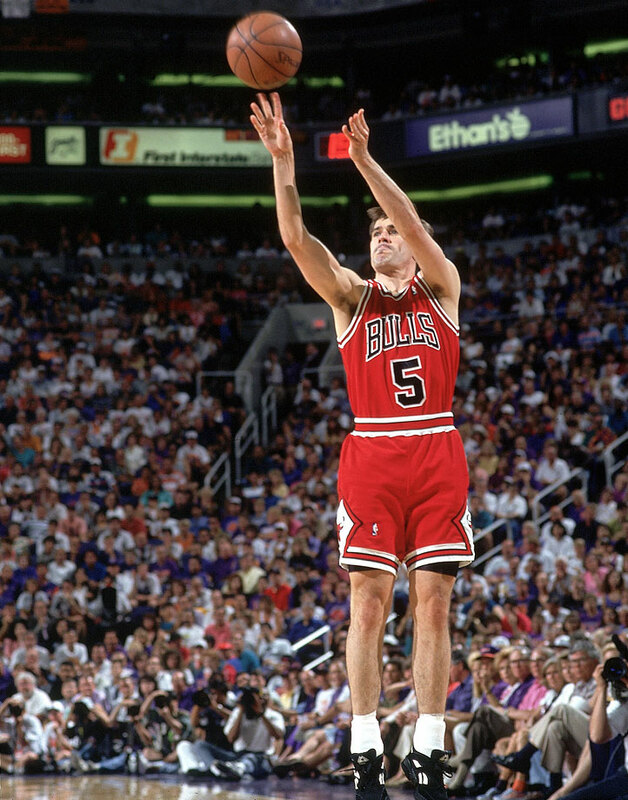 On a team like the Michael Jordan led Bulls, Steve Kerr and John Paxson earned their stripes with a huge shot when it was crunch time. 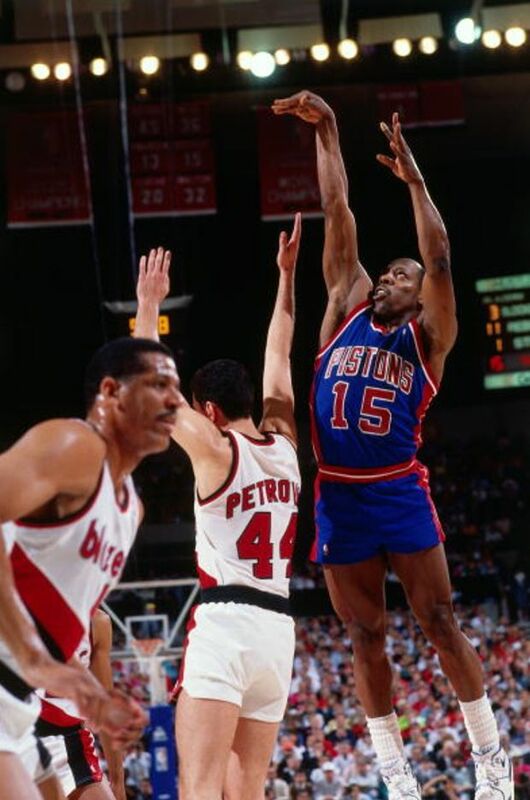 Leave it up to Vinnie Johnson to take the shine on the Isiah Thomas and Joe Dumars led Bad Boy Pistons. Now, don't get me wrong, Vinnie Johnson is a legend of the game and his jersey number is retired, but considering the fact that Isiah Thomas was the man in that series, one would have expected him to get the last shot, and he had a chance to get the ball back. However, Vinnie had other plans. He took a jumper over a defender and won the game for his team and subsequently took all the life out of the Blazers and the Pistons closed it out in 6. -You knew this was going to make the list. It was impossible not to. 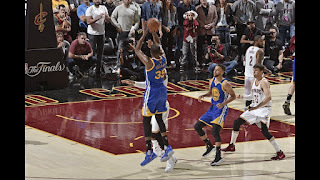 It's one of the most cold blooded shots and the shot that officially set Durant on the path to be the Finals MVP. He was scoring at will in the first two games, and as the 4th quarter came to a close, the Warriors made a run late in the game to attempt to come back and take a 3-0 lead. If the Cavs could close out the game, perhaps the momentum would shift in their favor. The Cavs had a 113-107 lead with just a few minutes to go, but two big shots from Steph and KD brought that lead to 113-111. 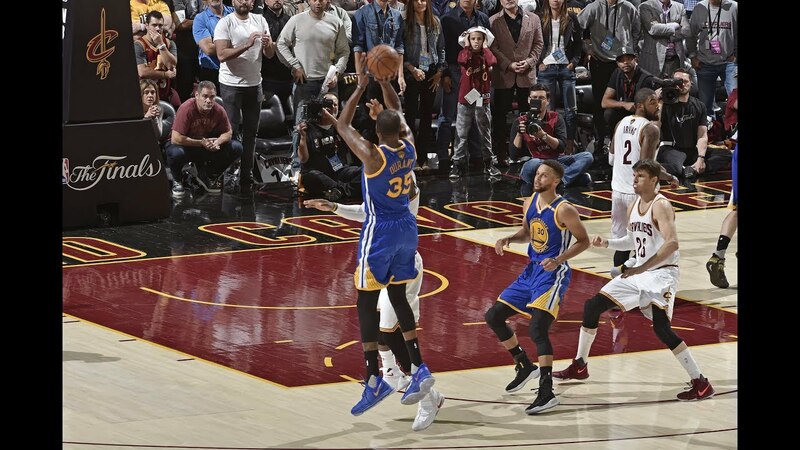 As the clock hit the 50 second mark, KD raced up the court and took the most infamous shot of the 2017 Finals, a shot that we've seen him utilized multiple times in the past. With his three pointer sailing over the outstretched arm of LeBron and sinking through the net, you could feel the air leave out of the Q and the Cavs. Durant completely crushed the Cavs with that one three pointer and that was the end of the series in my mind. Truly clutch. -The 76ers didn't win the NBA Finals. This much we know. 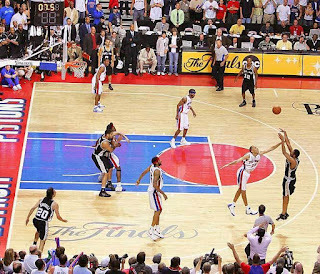 However, this shot is one of the most iconic shots and one of the most clutch shots in NBA Finals history without question. The Lakers had swept through the playoffs and seemed unstoppable. No one could stop them. No one could beat them. Not even once. That is until Allen Iverson took over late in the game in overtime. 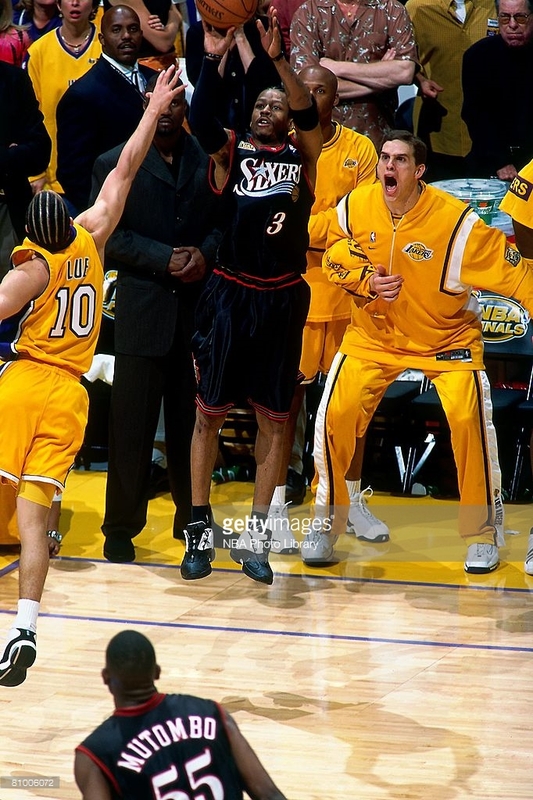 With the score 101-99 and less than a minute to go in the game, Iverson was being checked by Tyronn Lue who was actually playing good defense on him all game and even defended well on this possession. However, as Iverson hit a crossover and stepped back to take a contested jumper and drains it. What makes this shot even more special is the step over after the shot, but also the fact that it took the life out of a Lakers team that seemed untouchable all playoffs. However, this Lakers team would prove to be untouchable, as they would win the series in 5 games. Still, this shot is clutch. -Some say Ray Allen helped to save LeBron's legacy. I can't agree nor disagree with that assessment. However, it was this shot that changed everything for the Heat, as they seemed to be dead in the water most of the game and the Spurs seemed ready to celebrate. 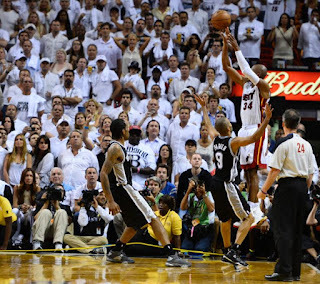 However, the Heat would see LeBron go crazy for the final minutes and bring them closer to tying the game, but after he missed a three while down three, Chris Bosh grabs the rebound and kicks it out to Ray Allen, who drains a tough contested three to send the game to OT. The Heat would win and force a game 7 where they ended up winning the NBA Title. 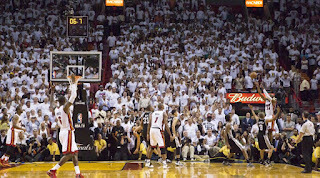 However, there would be no game 7 or a chance to even win without this big time shot. -With the game on the line, you wouldn't have expected Paxson to be the guy the fortune of the Suns and secure the game for the Bulls. The game was extremely close, Jordan was scoring at will, but on the final possession for Chicago, you knew Jordan would get defended pretty well. The Bulls were down two points and facing a possible game 7 for the first time in their Finals career. As Pippen sent the ball to Horace Grant, Grant found Paxson who had a great shot behind the three point line, and boom, Paxson drains the shot with just about 4 seconds left in the game, and the Bulls walk away with a three peat in the process. The definition of clutch. -With a rivalry like the Lakers vs Celtics, you knew that there had to be one of the more iconic game winners on this list. 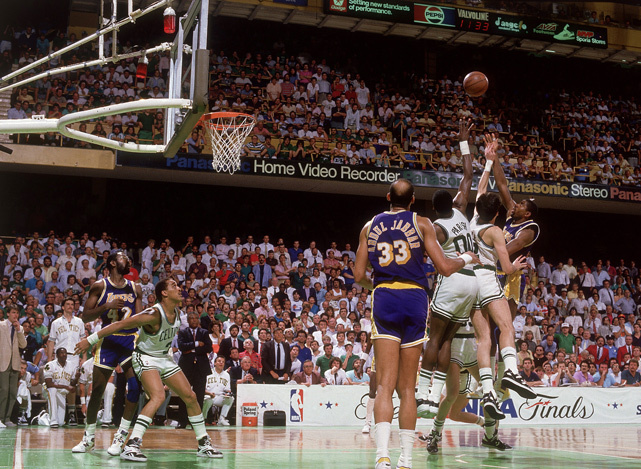 Magic Johnson had proven to be clutch in general as he could take over the game and lead the offense, but when it came to the final moments of a big game in the Finals, nothing could compare to what we were about to see. As the clock began winding down, Magic knew what he had to do. 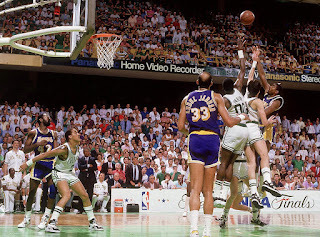 The Lakers were down one point and needed a big shot to take the lead and Magic stepped up with the "junior, junior sky hook" over the arms of Larry Bird, Robert Parish, and Kevin McHale, which makes the shot even more special. This is the biggest shot of Magic's career and the biggest shot of the 1987 Finals for sure, as Magic secured his fourth title in this series. That shot killed any hope the Celtics had of coming back in the series. 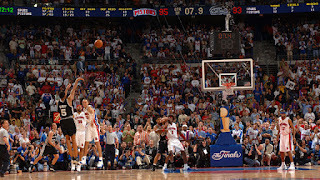 -The greatest shot in NBA history. 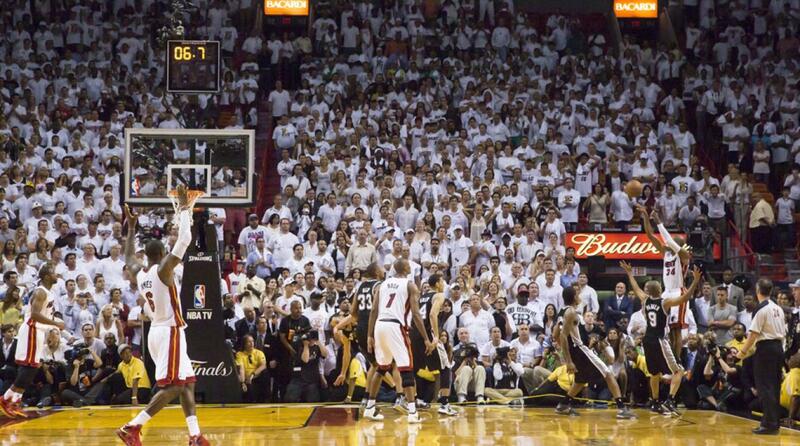 The most clutch shot in the NBA Finals. It still remains. 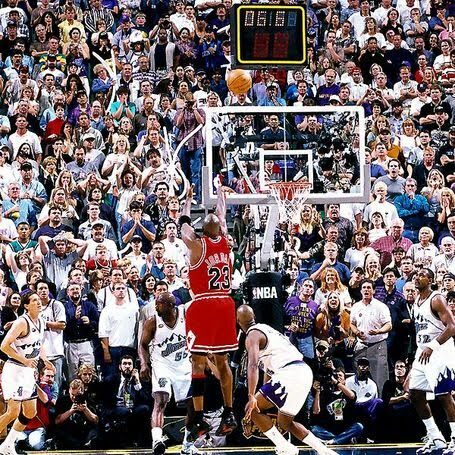 It's the greatest shot and the official end of the career of the greatest player to lace up his sneakers. With an injured Scottie Pippen, no chance at a lot of rest, and a focused Utah Jazz team, the Bulls struggled throughout game 6 mightily. However, this is Michael Jordan we're talking about and sure enough, in the final seconds of the game, Jordan made three huge plays in a row. After scoring quickly to put the Bulls back within one point, the Jazz had the ball with about 25 seconds left on the clock. As Karl Malone set up in the post, the defensive minded MJ strips the ball from his hands and brings it up court. He hits a crossover (with a slight push) and drains a mid range jumper with 5 seconds left to put the Bulls up 87-86. 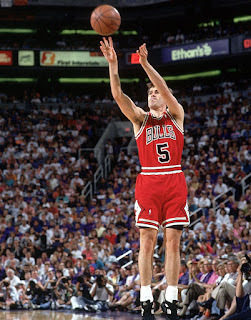 After a missed three by John Stockton, the Bulls would win the game and the NBA Finals. 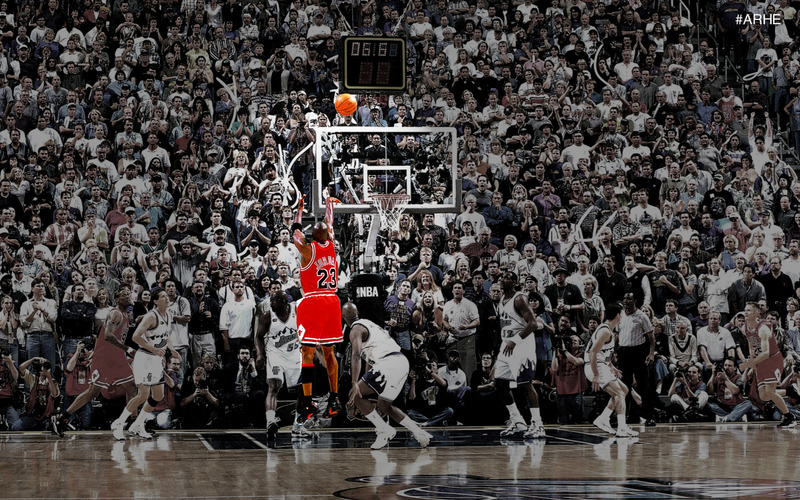 Without the poise and ability of Jordan in this game, the Bulls would have experienced their first game 7 in the Finals. 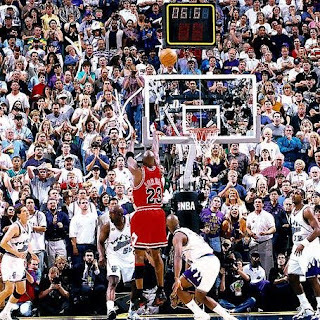 However, Jordan left us with a lasting memory of why he's the greatest ever with that final shot, the most clutch shot not only in NBA Finals history, but NBA history. Period.